Additionally, two more information pieces of information relative to Hospice CAHPS - updates to the Q & A and some technical corrections and clarifications to the quality assurance guidelines document that was previously posted are also now available. 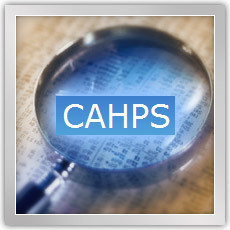 The Hospice Payment Final Rule reminds hospices that national implementation of the Hospice CAHPS survey begins January 1, 2015. Hospices must participate for at least one month during first quarter of 2015 and begin continuous monthly participation April 1, 2015. Participation during CY2015 will impact hospice payment rates during FY2017. If a hospice is eligible to participate, the Hospice will be required to select and contract with an approved vendor and the Hospice will be required to authorize the vendor to collect and submit data on the Hospice’s behalf. These actions must be taken prior to the beginning of participation in the “dry run” period, which runs for the first quarter of CY2015. Once monthly participation begins (April 1, 2015), hospices will submit contact information for relatives of patients that died that month to the vendor of their choosing. After a short time lag (a few months) vendors will distribute the Hospice CAHPS survey to the family members of the patients. CMS advises that hospices develop a policy that will help ensure compliance with the requirement for monthly data submission to the vendor. Read more in the NAHC Report.